A chough collecting nest material for the 2018 breeding season. Photo by Liz Corry. The choughs started nest-building this month. Established pairs returning to their faithful nest sites and younger pairs setting up in new locations. Green and Black were the first pair seen taking wool and dry grass from Sorel across into the Quarry. Rather apt at Easter time. Yes Green & Blacks we will accept sponsorship. Yes payment can be in the form of chocolate (sustainable/palm oil free). Whilst we have only witnessed a few individuals carrying nesting material we suspect all twelve males will attempt to breed. Some may simply carry twigs following the lead of the female. We hope the majority will go all the way and raise chicks. A lot of the success is dependent on age; three-years old being the average age females start laying eggs. Trying to follow twelve males around Jersey is proving challenging for myself and our student Elin. We are being helped by Ronez Quarry staff and reports from the public (including zoo keepers on their days off – no rest for the wicked). We do suspect a small group of choughs are flying under the radar exploring new parts of the island. 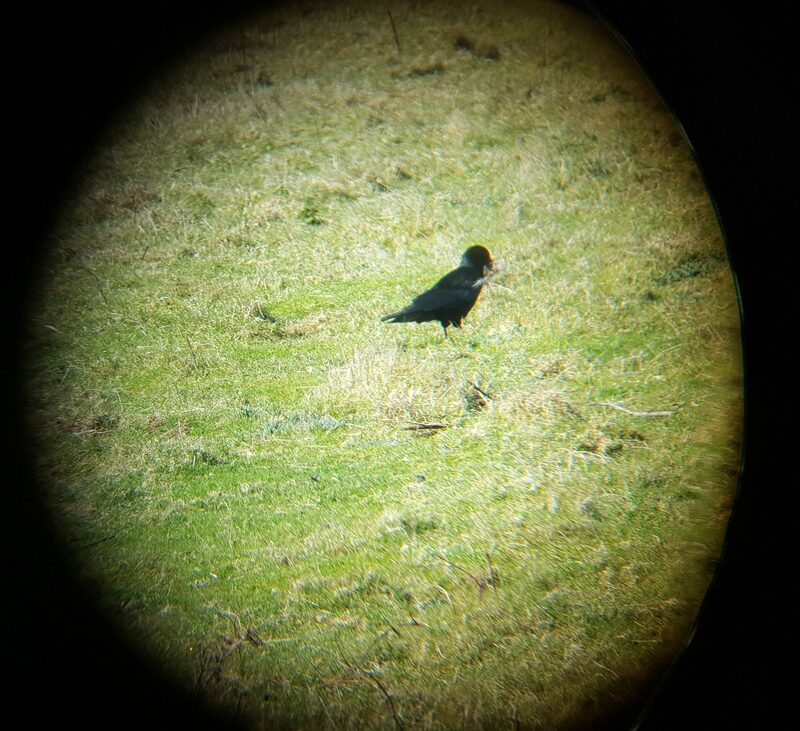 We had our first confirmed sighting of choughs over the Zoo. Five were spotted by our Conservation Learning manager flying in a westerly direction over the car park. This was the same week we had an unconfirmed sighting by a member of the public of two choughs sat on a roof top in Gorey. It definitely looks set to be an interesting breeding season. As always please do send in your sightings to bote@gmail.com or phone 01534 860059. Gianna, our ‘foster mum’ for the captive breeding programme, had developed cataracts in both eyes. We called in specialists from the UK to assess Gianna’s condition with the view to operate. Ophthalmologist Claudia Hartley and nurse Kelly Shackleton from Langford Vets, Bristol, flew over at the end of February. Claudia has previously helped Jersey Zoo to save the sight of one of our lemurs so we knew Gianna was in good hands. Operating theatre at Jersey Zoo. Photo by Liz Corry. 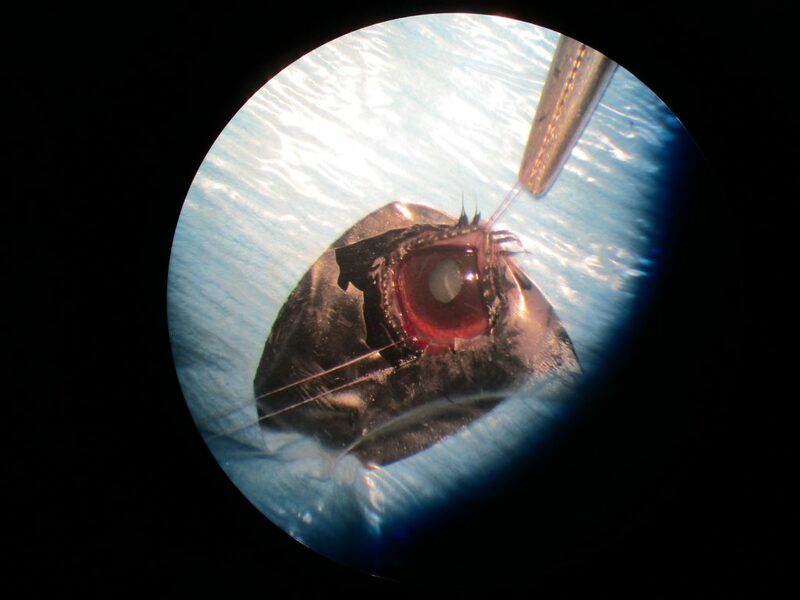 As you can imagine cataract removal is a very delicate operation. The delivery and maintenance of anaesthetic in a patient weighing less than 300g is equally sensitive. The operation had to be aborted on the first two attempts due to equipment malfunctions in the operating theatre. Understandably staff did not want to chance anything. The operation was postponed until March. 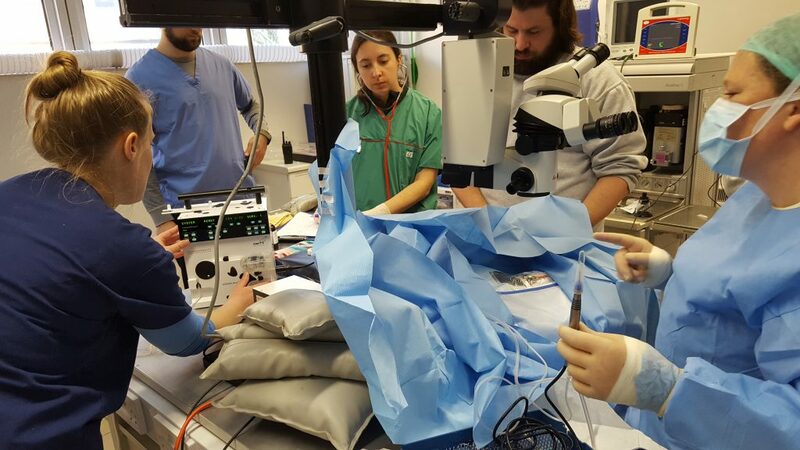 Langford Vets and the Durrell vet team attempt to remove cataracts from Gianna’s eyes. Photo by Liz Corry. They say “third time lucky”, but luck had nothing to do with it. Perseverance, dedication, and immense skill meant that the third attempt was successful. Gianna’s operation took nearly three hours from ‘knockdown’ (going under anaesthetic) to stitching and waking up. 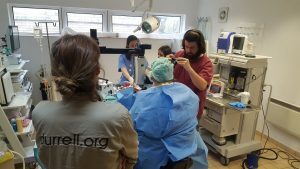 Now for the technical bit…Durrell Vet Alberto Barbon who assisted with the op said that “Gianna underwent a bilateral phacoemulsification to remove cataracts. Surgery and anaesthesia went well, although she developed a hyphaema in the right eye following the surgery, we are hoping that this will resolve over the next two weeks”. In simple terms she has a sore eye, but it will heal and she will regain full sight. We are very grateful to Claudia and Kelly for helping Jersey Zoo once again. They also found time to perform sight-saving surgery on seven dogs and two horses at New Era vets before they left Jersey! Cataract removal in a chough at Jersey Zoo. Photo by Alberto Barbon. Upturned guttering fixed to the polytunnel to deter rodents climbing up and chewing holes in the netting. Photo by Liz Corry. 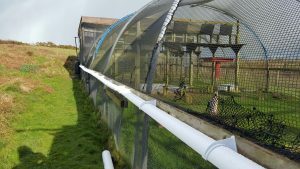 Up-turned guttering has been fitted around the edges of the netting at the release aviary. In theory, the slippy plastic and angle of guttering prevents rodents from reaching the net. We have already noticed a difference and are now working on making sure there are no rodents trapped inside the aviary through adding this. We are very grateful to the Royal Bank of Canada who provided funding for the guttering and fixtures. The enclosed food tray mentioned in last month’s report has not met with approval from the choughs. This would have alleviated the rodent problem by preventing food spillage. We will have to come up with another design. Dr Robert Pal, director of restoration at Montana Tech of the University of Montana recently visited Jersey as part of his whirlwind tour of the UK. He was invited over by his friend Lee Durrell and kindly gave a talk to staff and volunteers at Jersey Zoo. 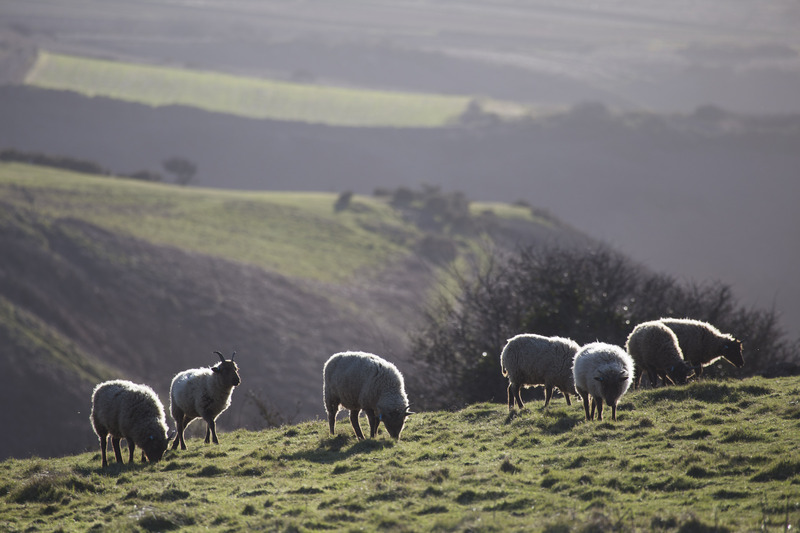 Dr Pal’s main research focus has always been the study of the flora and vegetation of disturbed habitats, including agricultural and urban areas. Terrestrial restoration to native communities and ecosystems is often hampered by exotic invasive species. The talk entitled “Exotic invasions and restoration – parallel paths in ecology” explained how fundamental ecology, restoration, and exotic invasion can be jointly interpreted and merged into an integrated framework. The Manx Loaghtans contribute to the ecological restoration of Jersey. Photo by Robert Pal. Dr Robert Pal with Durrell student Elin Cunningham. Photo by Judit Nyulasi. We always encourage students to consider the Birds On The Edge project when they are deciding on their dissertation projects both undergraduate and postgraduate. This year has seen quite a bit of attention with three projects either underway or in the pipeline. The current chough placement student, Elin Cunningham, is studying Bioveterinary science at Harper Adams University. Whilst she assists with day-to-day management of the chough project she is also collecting and analysing faecal samples from captive and wild choughs to assess parasite levels. More to follow when she writes her blog for this site. Miriam Lord, from Oxford University, visited this month to do some scoping work for her dissertation. Miriam will be assessing public awareness and attitudes to the chough reintroduction. She plans to return in summer to conduct questionnaires with people in the Zoo and in St Helier town centre. A similar project will be undertaken by Catherine Firth, Nottingham Trent University. Her focal group will be primary schools. As well as gathering information Catherine hopes to provide educational talks to schools willing to participate. This will commence in June before schools break for summer. 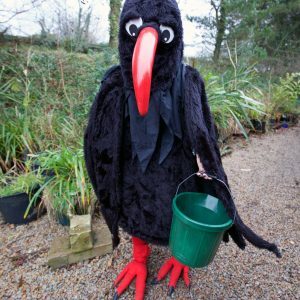 Cauvette the chough will be making an appearance this summer – which lucky student will get the privilege? Photo by Tiffany Lang. 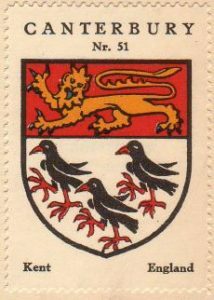 Cornish choughs, Channel Island choughs, and Kentish choughs? 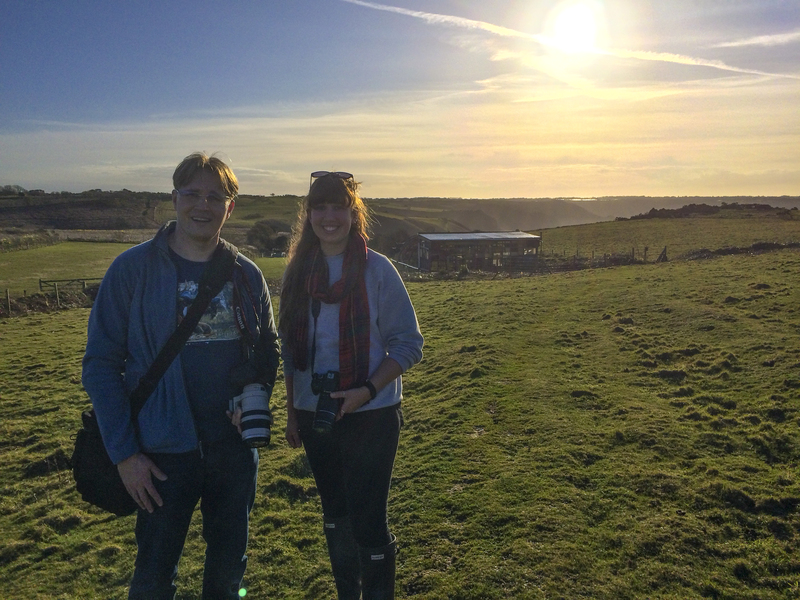 Continuing the student theme, we had a visit from Jack Slattery who has started his PhD looking into the feasibility of reintroducing choughs to Kent. This is with the Durrell Institute of Conservation and Ecology (DICE) based in Canterbury, Kent. As a bird enthusiast Jack was impressed with the project in Jersey. His interest, as part of the study, is less about how we reintroduced the choughs and more about stakeholders involvement and attitudes. Stakeholders include a wide range of people such as our project partners, landowners, and the general public. We have been quite fortunate in Jersey to receive a lot of positive support. Jack has to predict whether or not Kent will see the same. This entry was posted in Blog, Choughs, Top News and tagged cataract, chough, Gianna, nest, zoo by Glyn Young. Bookmark the permalink. Thanks Liz. Great report and nice to see breeding moves underway. Also, it’s nice to see so much interest from students in the project.